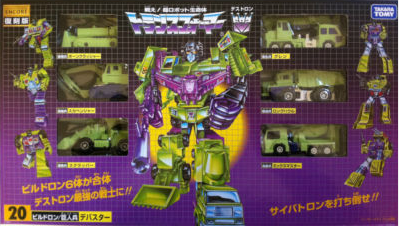 We have received news from Takara Tomy for the latest Transformers Encore series, the ultra hot transformers G1 reissue line from Takara! And the latest Encore #20 will be the Devastator Combiner! We have yet to receive the picture from them but stay tuned for the latest update at Toywiz Malaysia and Toy Garden!. Accepting preorder now at RM329 each and release date will be Nov 2011 In stock now at Toy Garden and Toywiz Malaysia for RM330.